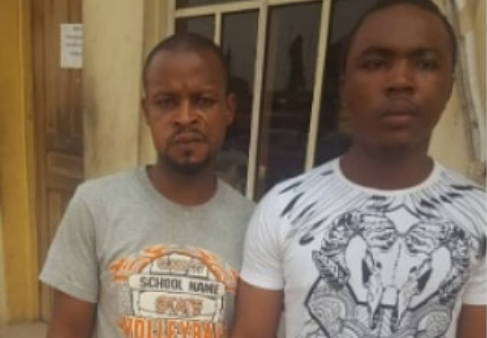 The police in Lagos have arrested two househelps, Ben Peters and Matthew Johnson Abam, for robbing an old couple of their Toyota Camry saloon car, 2008 model, five thousand United States Dollars, six packet shirts and a Motorola Android phone. The first suspect was arrested in his hideout at Agege after allegedly robbing 73-year old retiree, Mr. Alexander Okoye, and his wife, Mrs. Njideka Okoye. The suspect was employed as a househelp on October 12, 2018, and spent just 11 days in the house of the old couple before robbing them. According to the state police command spokesman Chike Oti: ”On October 24, 2018, Mr & Mrs Okoye cried out to the Commissioner of Police, Lagos State, Edgal Imohimi through a written petition, complaining of how the said Ben Peters who was with them for just eleven days, stole their valuables including their Toyota Camry saloon car, 2008 model, five thousand United States Dollars, six packet shirts and a Motorola Android phone. ”Based on their complaint, the Lagos police boss directed CSP Kemi Adedeji and team attached to the Command’s Human rights section to launch a manhunt for the fleeing househelp. ”On 18/12/2018, barely two months after the incident, the said Ben Peters was arrested from a hideout in Agege, Lagos and some of the stolen items recovered from him. ”Investigation so far revealed, that his real name is Usang Bassey Effiong and not Ben Peters as he made his employers to believe. ”Meanwhile, the suspect has confessed how he committed crime. He narrated that he noted where Mr. Okoye usually hide his bedroom key and to gain access to it, he needed to duplicate the living room key; so he went ahead and made a copy of the living room key. ”It was on October 23, that he made up his mind to break into the couple’s bedroom. And to do so undetected, he disconnected the CCTV camera that would have recorded his activities, picked up the bedroom key and constructively broke into the couple’s room, stole their valuables and thereafter, drove off with their car. ”The suspect added that robbing the couple was easy for him because the househelp they dismissed before employing him, one Matthew Johnson Abam, was a member of his thieving syndicate and he had furnished him with relevant information about the couple even before he came to live with them. ”The CP urges employers of domestic servants to be painstaking in carrying out background checks on them to minimise situations whereby these unverified servants take advantage of employers.